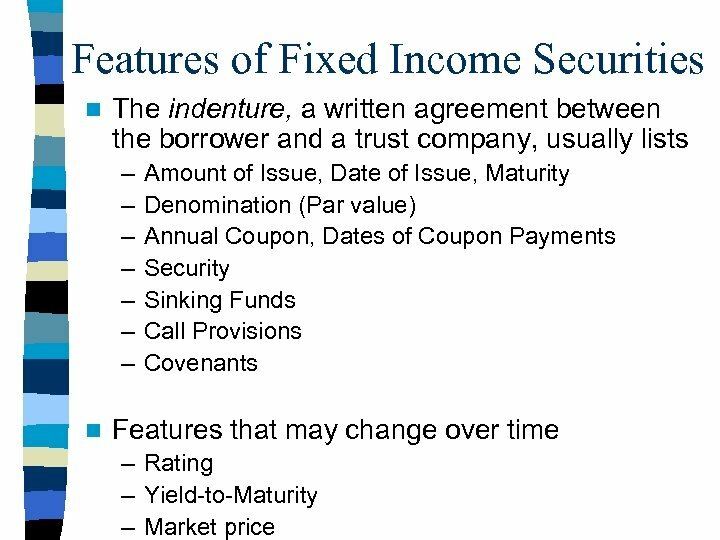 Features of Fixed Income Securities n Maturity : - The length of time until the agreement expires. 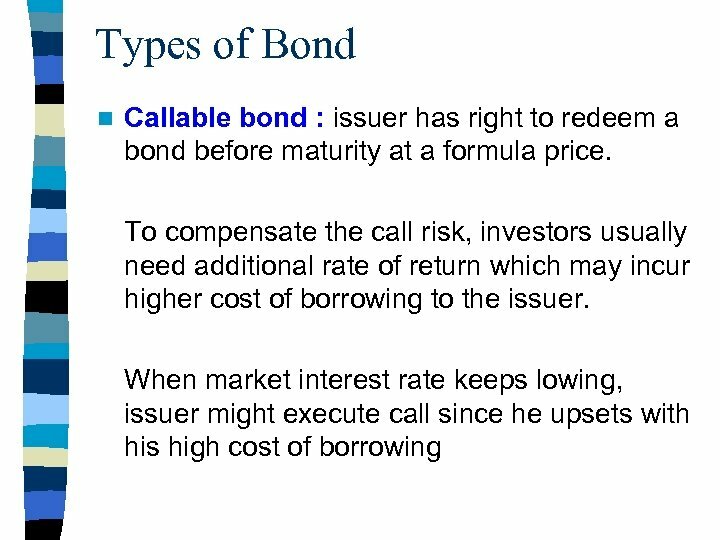 - Borrowers (Issuers) are committed to meet their obligations over this period n Coupon : - The rate which used for calculating the amount of interest to be paid. n Frequency : - Quarterly : coupon will be paid every 3 months. - Semi-annual : coupon will be paid every 6 months. - annually : coupon will be paid every 1 years. 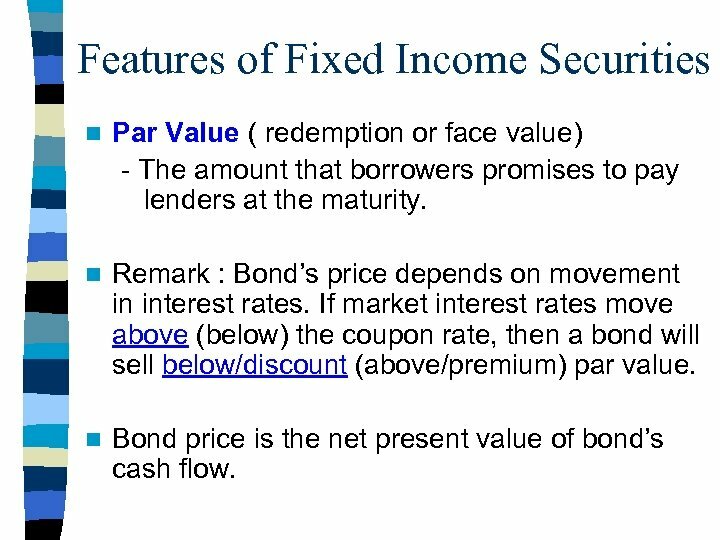 Features of Fixed Income Securities n Par Value ( redemption or face value) - The amount that borrowers promises to pay lenders at the maturity. 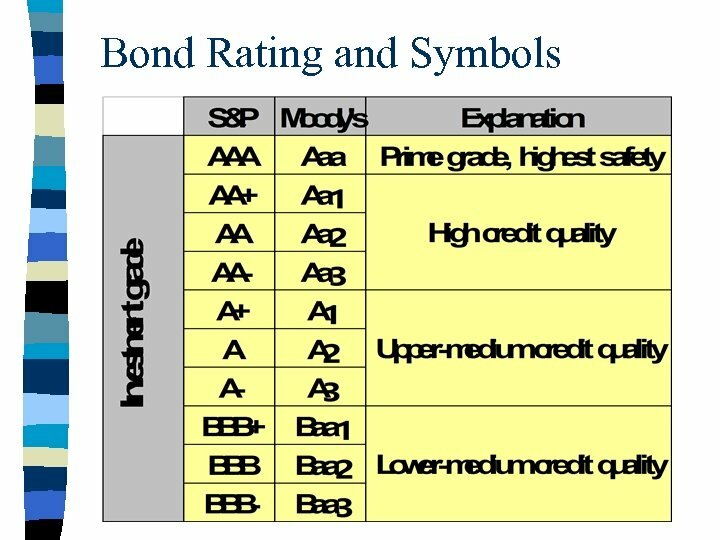 n Remark : Bond’s price depends on movement in interest rates. If market interest rates move above (below) the coupon rate, then a bond will sell below/discount (above/premium) par value. 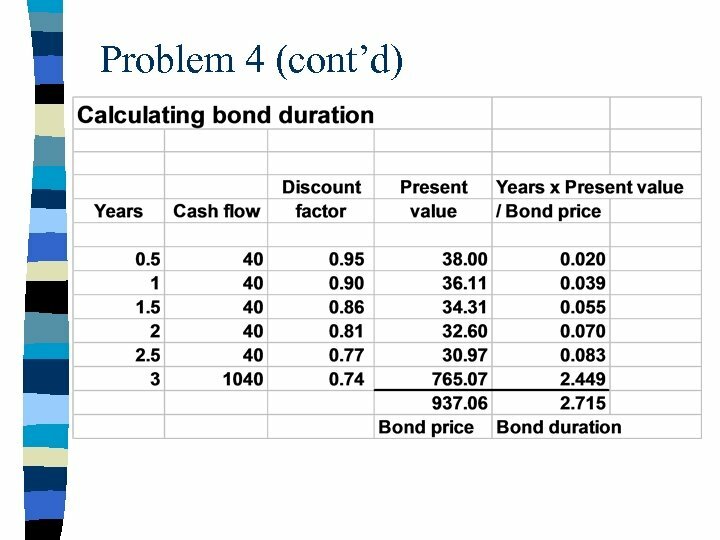 n Bond price is the net present value of bond’s cash flow. 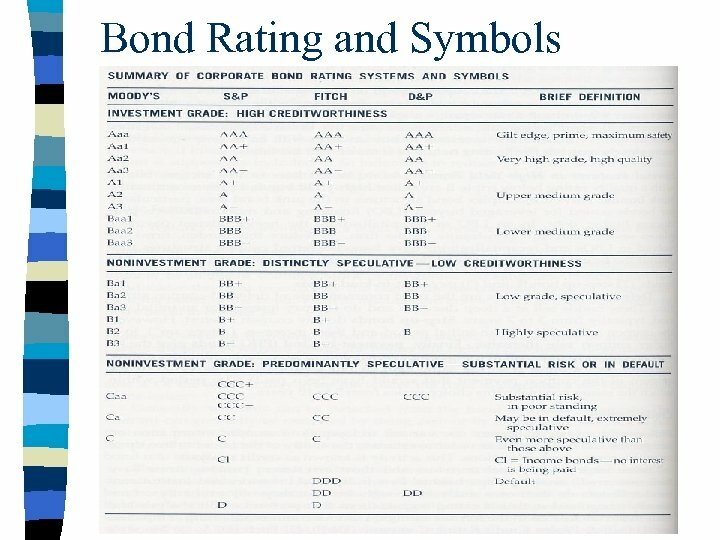 Bond Ratings n What is rated: – The likelihood that the firm will default. 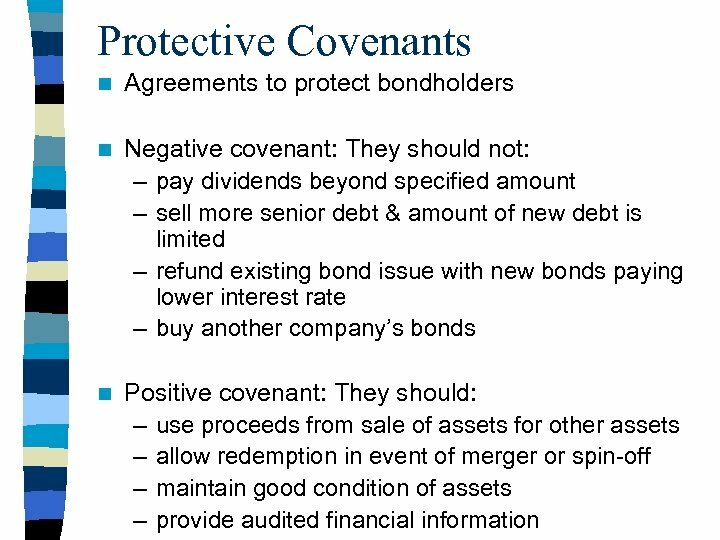 – The protection afforded by the loan contract in the event of default. 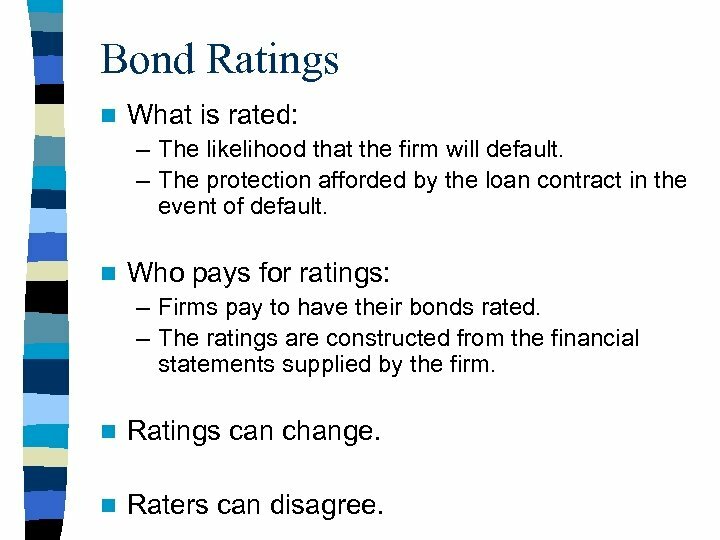 n Who pays for ratings: – Firms pay to have their bonds rated. 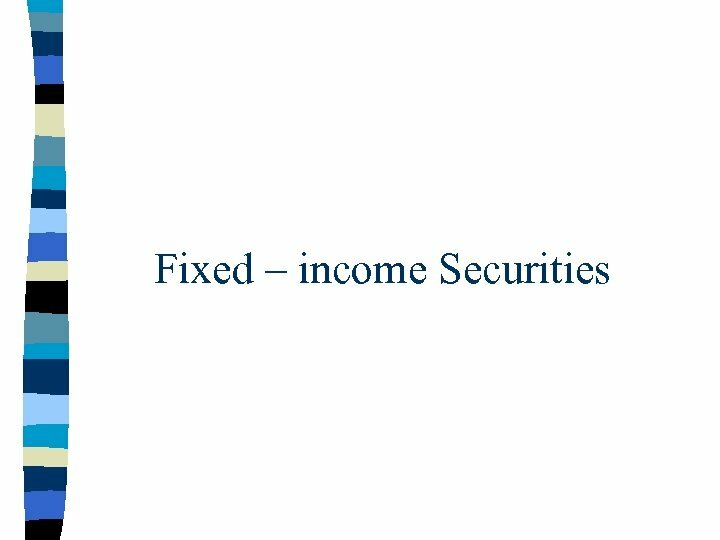 – The ratings are constructed from the financial statements supplied by the firm. n Ratings can change. n Raters can disagree. 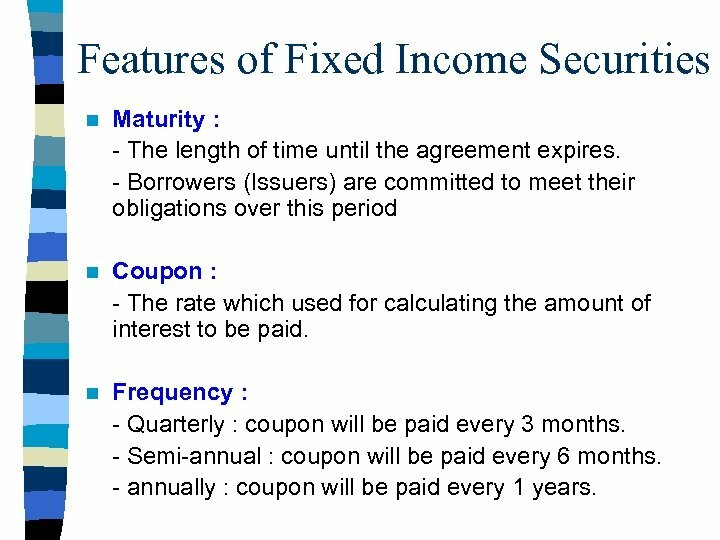 Types of Bond n Fixed rate : the coupon rate constantly fixed. 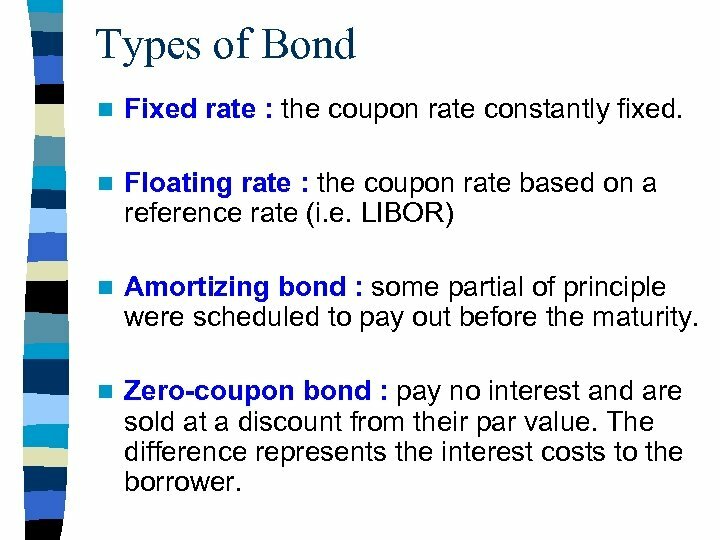 n Floating rate : the coupon rate based on a reference rate (i. e. LIBOR) n Amortizing bond : some partial of principle were scheduled to pay out before the maturity. 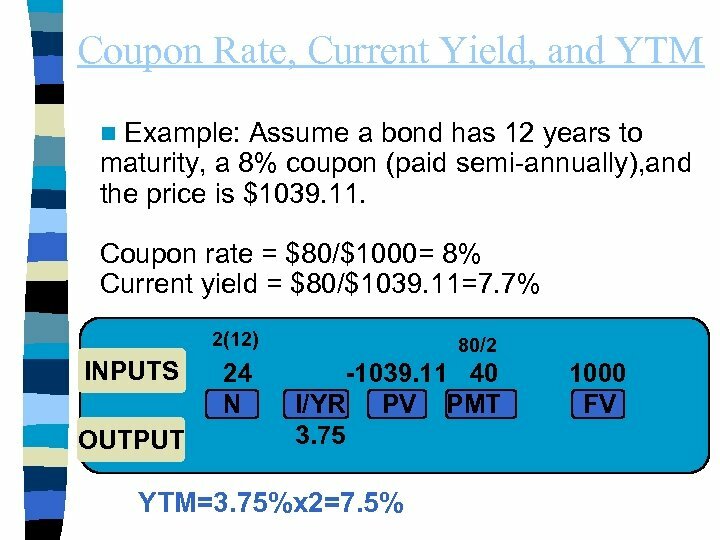 n Zero-coupon bond : pay no interest and are sold at a discount from their par value. The difference represents the interest costs to the borrower. 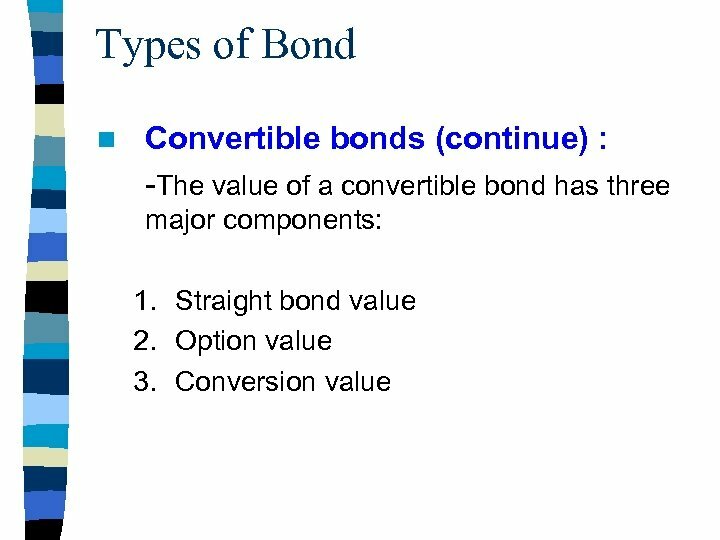 Types of Bond n Puttable bond : investors have right to redeem the bond before maturity at a formula price. 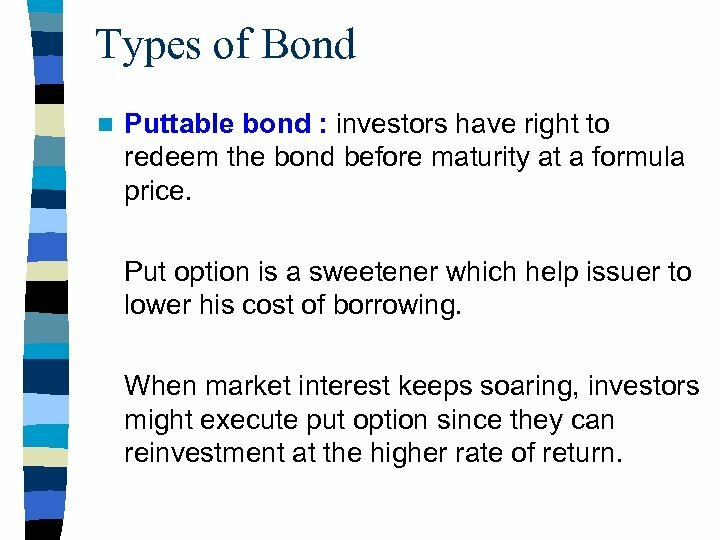 Put option is a sweetener which help issuer to lower his cost of borrowing. 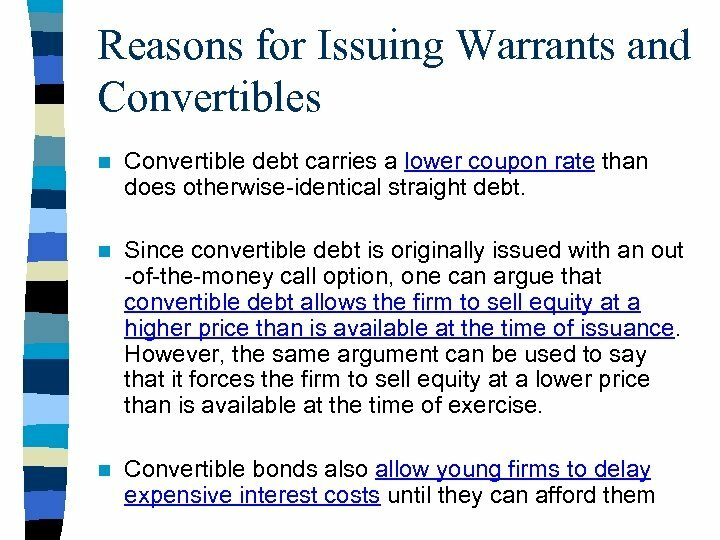 When market interest keeps soaring, investors might execute put option since they can reinvestment at the higher rate of return. 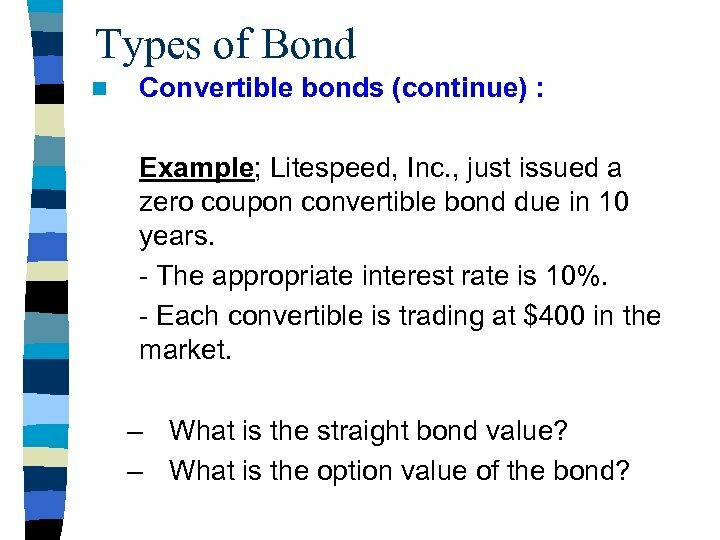 Types of Bond n Convertible bonds (continue) : Example; Litespeed, Inc. , just issued a zero coupon convertible bond due in 10 years. - The appropriate interest rate is 10%. - Each convertible is trading at $400 in the market. 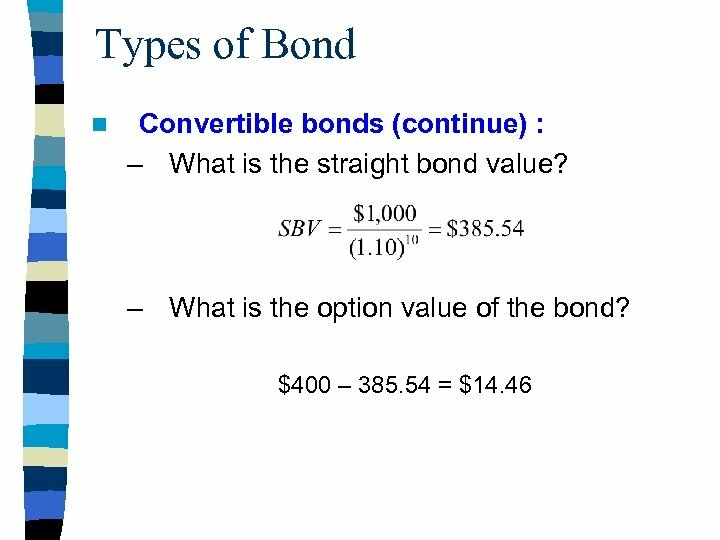 – What is the straight bond value? 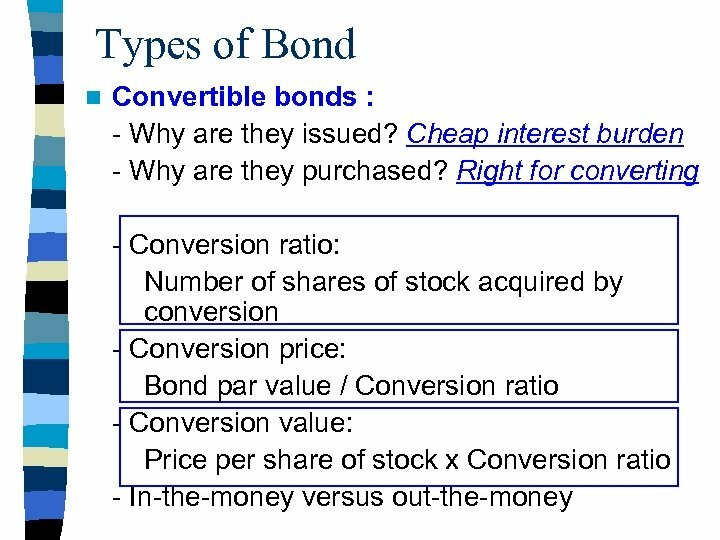 – What is the option value of the bond? 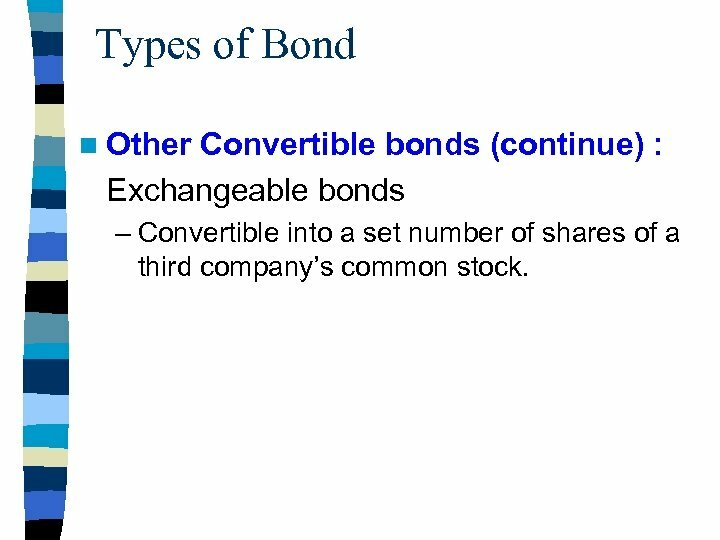 Types of Bond n Other Convertible bonds (continue) : Exchangeable bonds – Convertible into a set number of shares of a third company’s common stock. 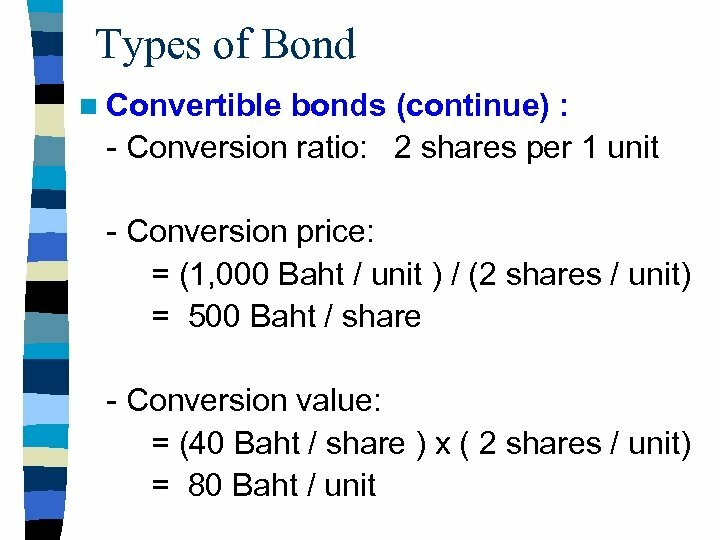 Bond Pricing n Example : Thai government bond (LB 04 NA) par 1, 000 Baht which will mature on Nov 30, 2002 pay coupon 3. 50% semi-annually. A) What is the amount of interest paid in each coupon date? Coupon = 1, 000 x (3. 50%)/2 = 17. 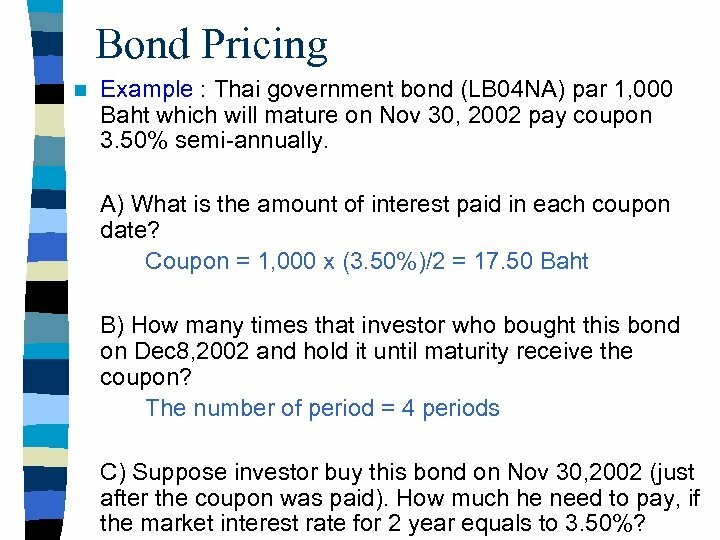 50 Baht B) How many times that investor who bought this bond on Dec 8, 2002 and hold it until maturity receive the coupon? 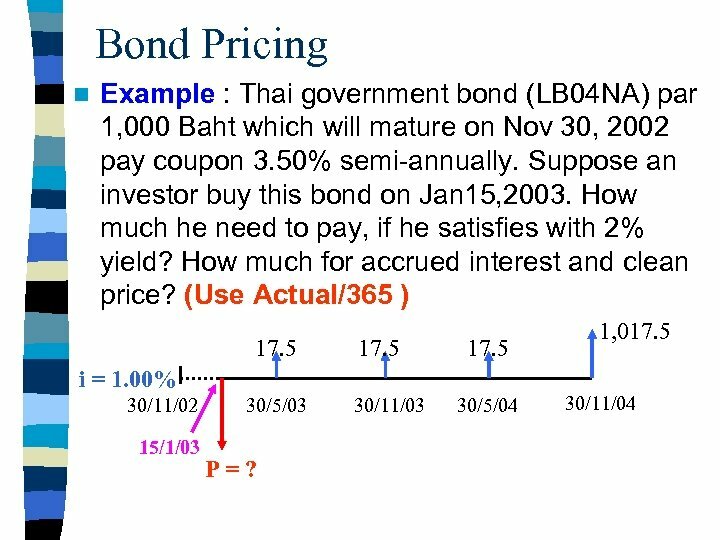 The number of period = 4 periods C) Suppose investor buy this bond on Nov 30, 2002 (just after the coupon was paid). How much he need to pay, if the market interest rate for 2 year equals to 3. 50%? 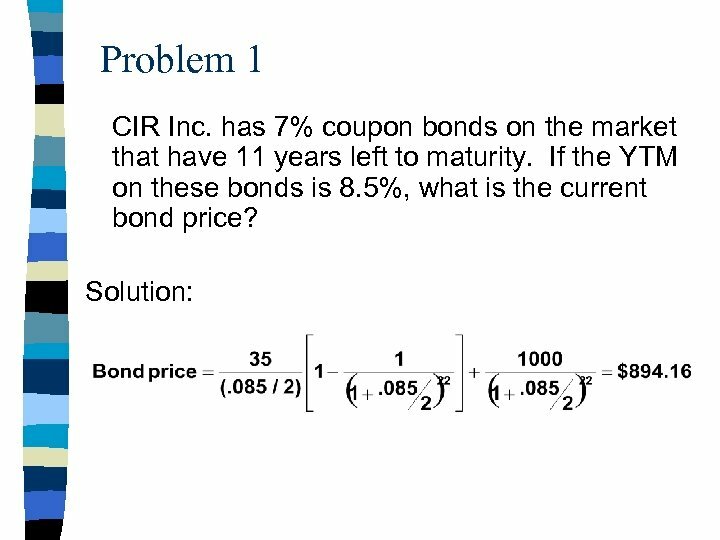 Bond Pricing i = 1. 75% 17. 5 P = ? 11/02 05/03 11/03 05/04 1, 017. 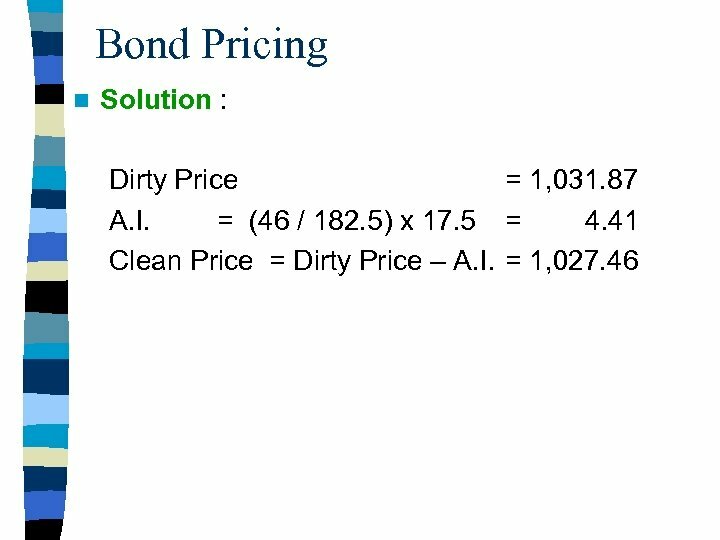 5 11/04 Price = PVIA(A=17. 5, i = 1. 75%, n=4) + PVIF(F=1000, i =1. 75%, n=4) = 17. 5 / ( 1. 0175 )1 + 17. 5 / ( 1. 0175 )2 + 17. 5 / ( 1. 0175 )3 + 1, 017. 5 / ( 1. 0175 )4 = (PMT = 17. 5; FV = 1, 000; n = 4; i = 1. 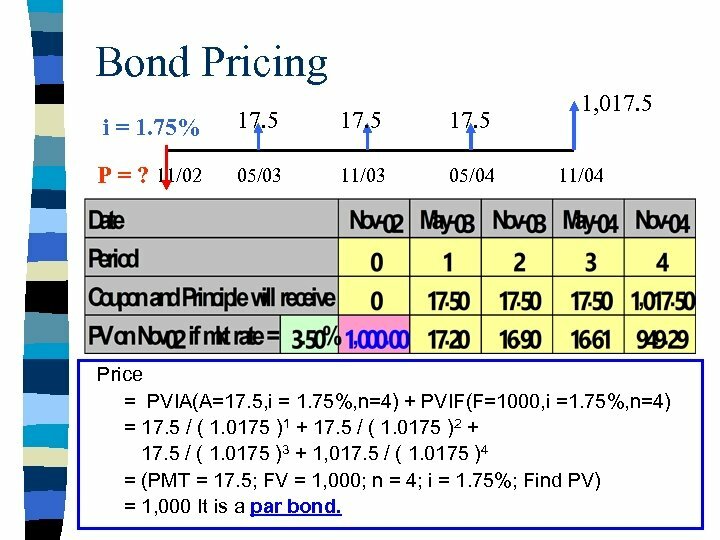 75%; Find PV) = 1, 000 It is a par bond. 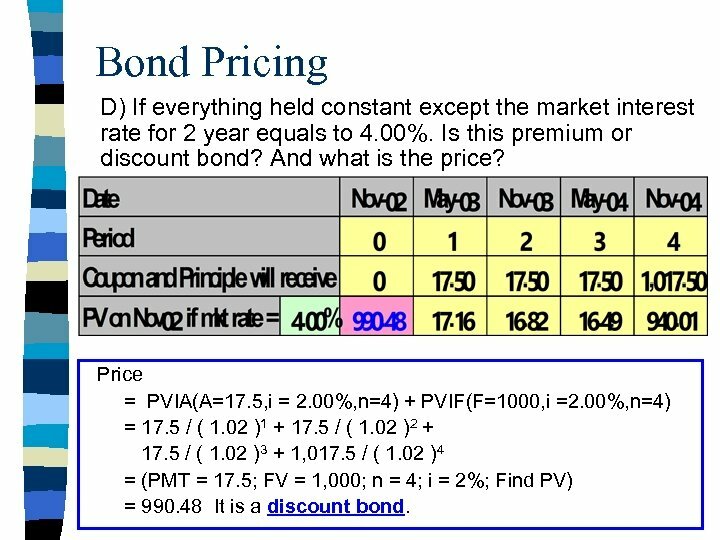 Bond Pricing D) If everything held constant except the market interest rate for 2 year equals to 4. 00%. 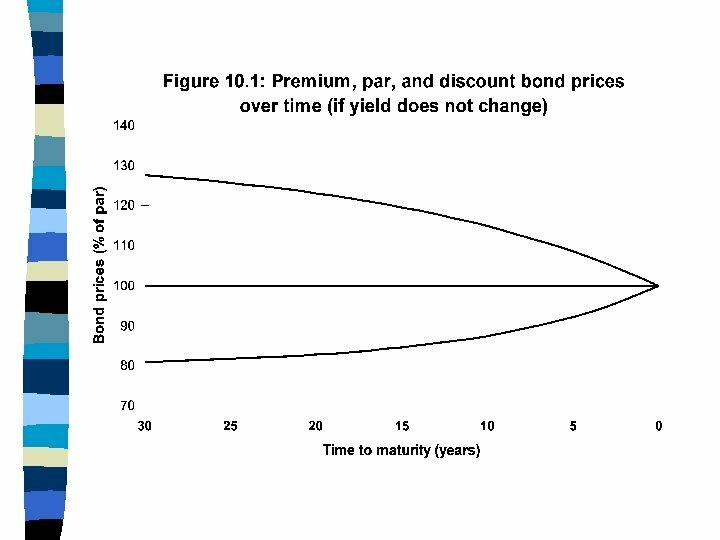 Is this premium or discount bond? And what is the price? Price = PVIA(A=17. 5, i = 2. 00%, n=4) + PVIF(F=1000, i =2. 00%, n=4) = 17. 5 / ( 1. 02 )1 + 17. 5 / ( 1. 02 )2 + 17. 5 / ( 1. 02 )3 + 1, 017. 5 / ( 1. 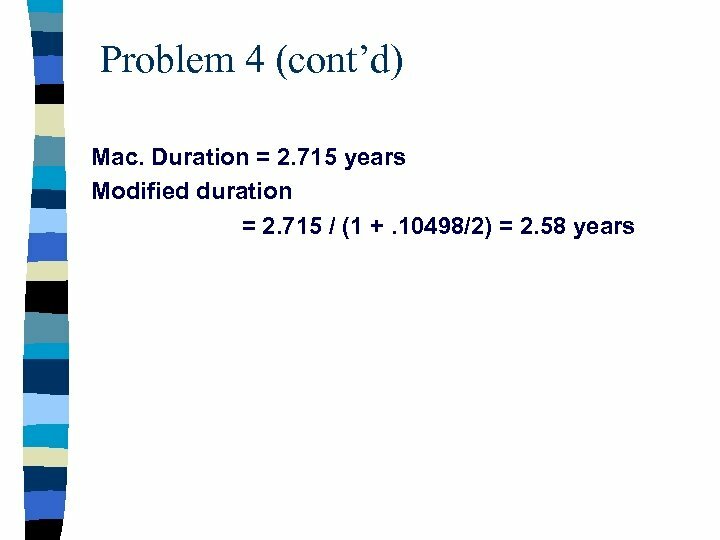 02 )4 = (PMT = 17. 5; FV = 1, 000; n = 4; i = 2%; Find PV) = 990. 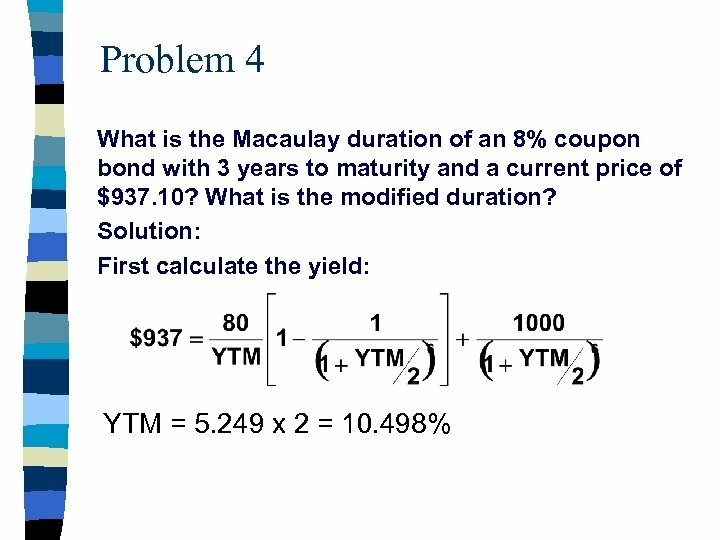 48 It is a discount bond. 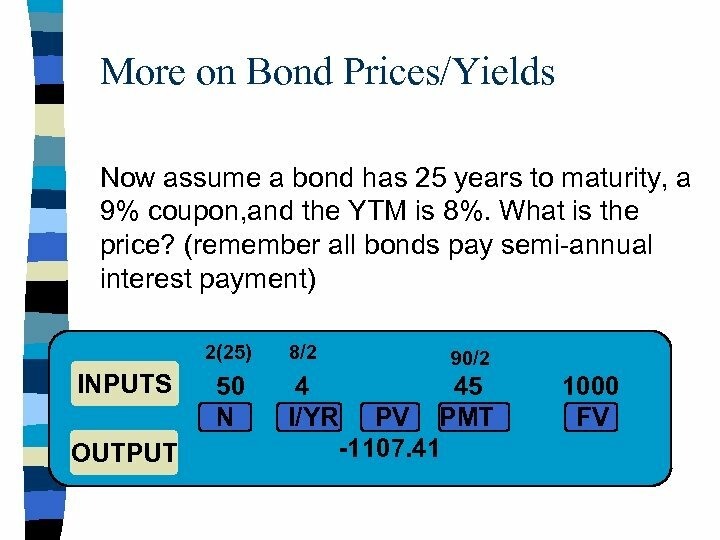 Bond Pricing F) If everything held constant except the market interest rate for 2 year equals to 3. 00%. 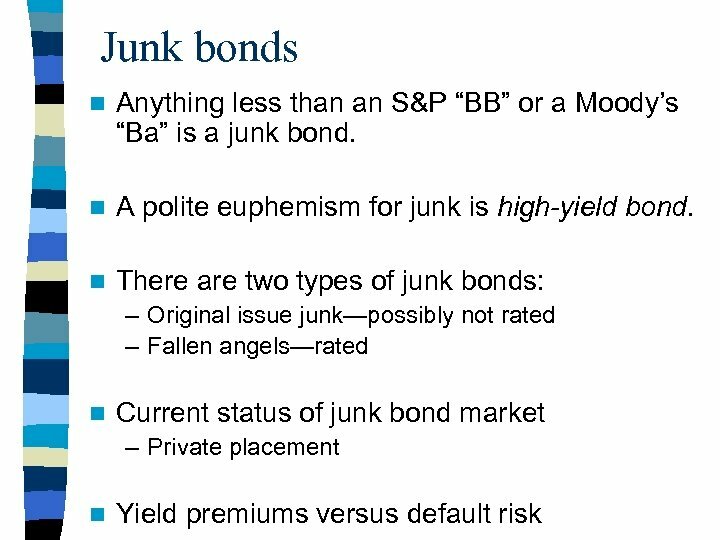 Is this premium or discount bond? And what is the price? Price = PVIA(A=17. 5, i = 1. 50%, n=4) + PVIF(F=1000, i =1. 50%, n=4) = 17. 5 / ( 1. 015 )1 + 17. 5 / ( 1. 015 )2 + 17. 5 / ( 1. 015 )3 + 1, 017. 5 / ( 1. 015 )4 = (PMT = 17. 5; FV = 1, 000; n = 4; i = 1. 50%; Find PV) = 1, 009. 64 It is a premium bond. 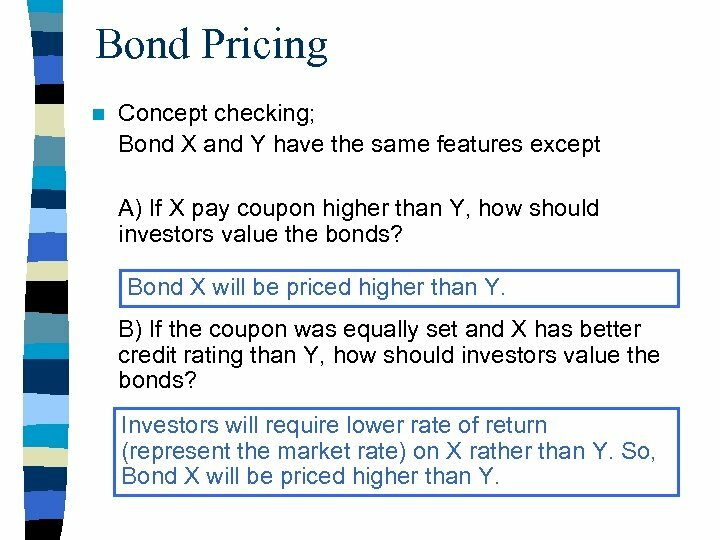 Bond Pricing n Concept checking; Bond X and Y have the same features except A) If X pay coupon higher than Y, how should investors value the bonds? 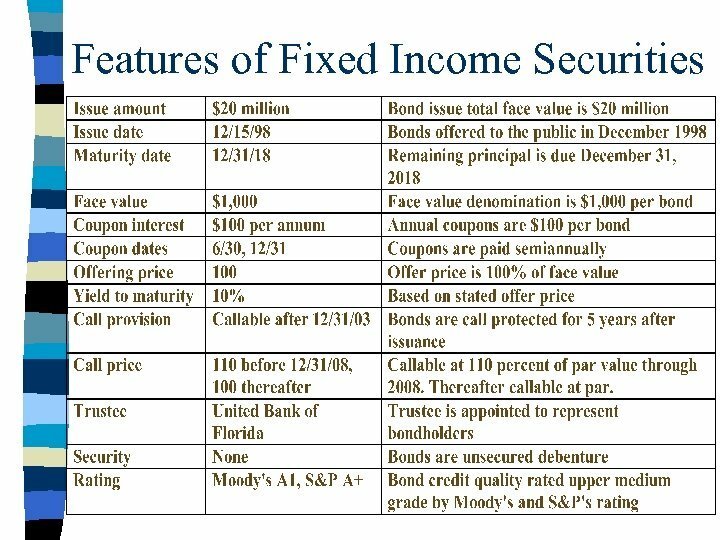 Bond X will be priced higher than Y. 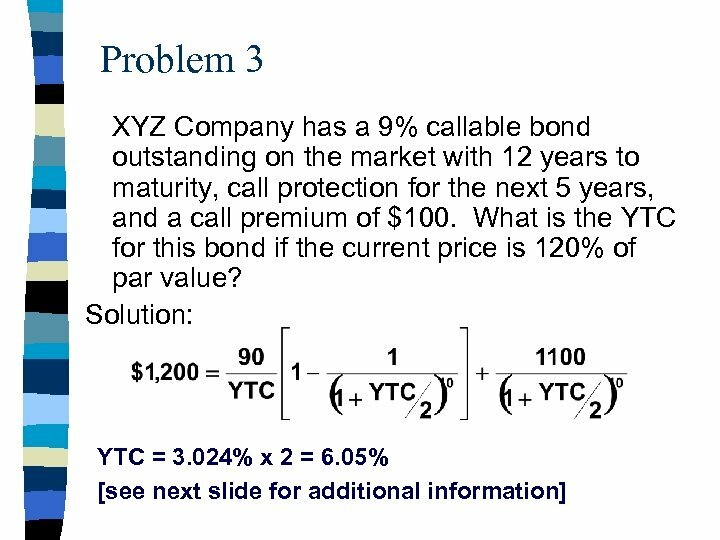 B) If the coupon was equally set and X has better credit rating than Y, how should investors value the bonds? 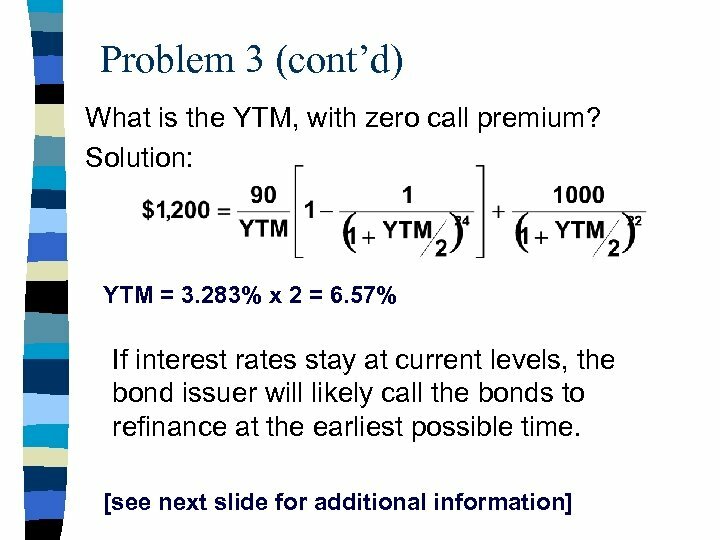 Investors will require lower rate of return (represent the market rate) on X rather than Y. 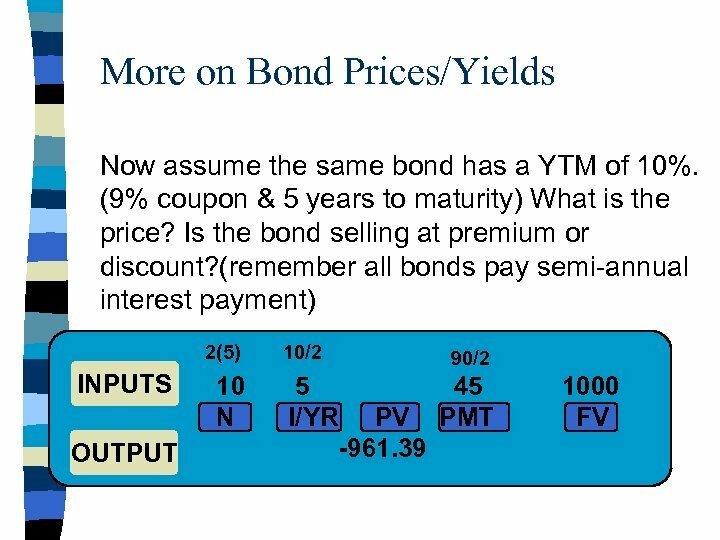 So, Bond X will be priced higher than Y. 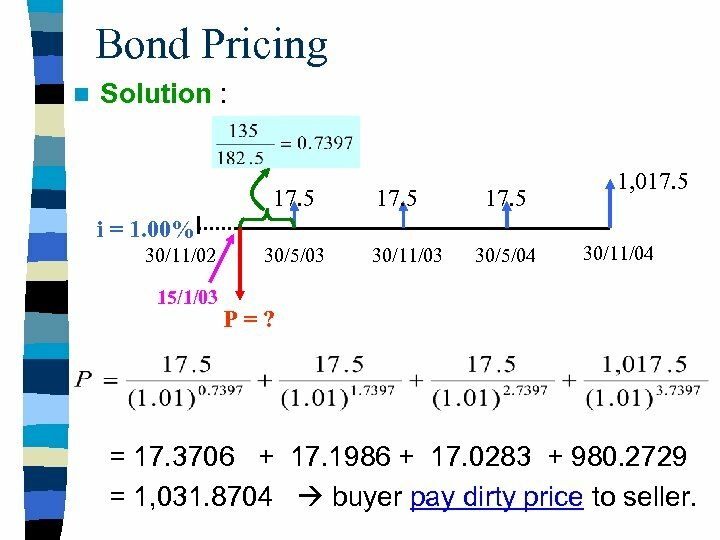 Bond Pricing n Solution : 17. 5 i = 1. 00% 30/11/02 15/1/03 30/5/03 30/11/03 30/5/04 1, 017. 5 30/11/04 P=? = 17. 3706 + 17. 1986 + 17. 0283 + 980. 2729 = 1, 031. 8704 buyer pay dirty price to seller. 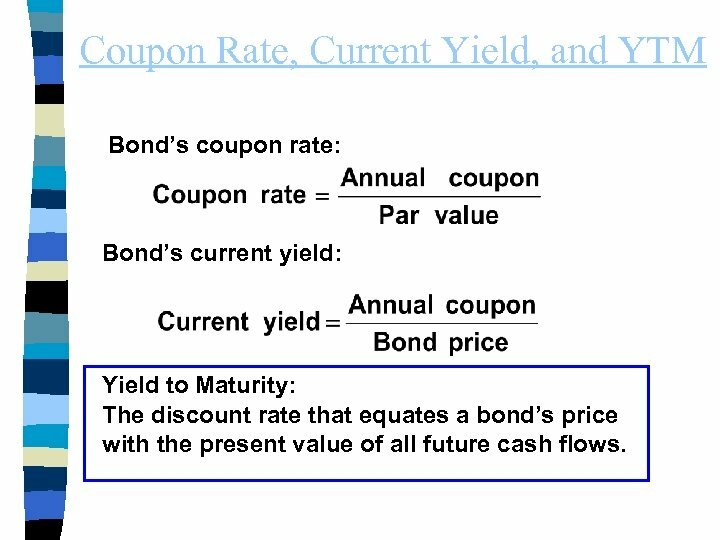 Coupon Rate, Current Yield, and YTM Bond’s coupon rate: Bond’s current yield: Yield to Maturity: The discount rate that equates a bond’s price with the present value of all future cash flows. 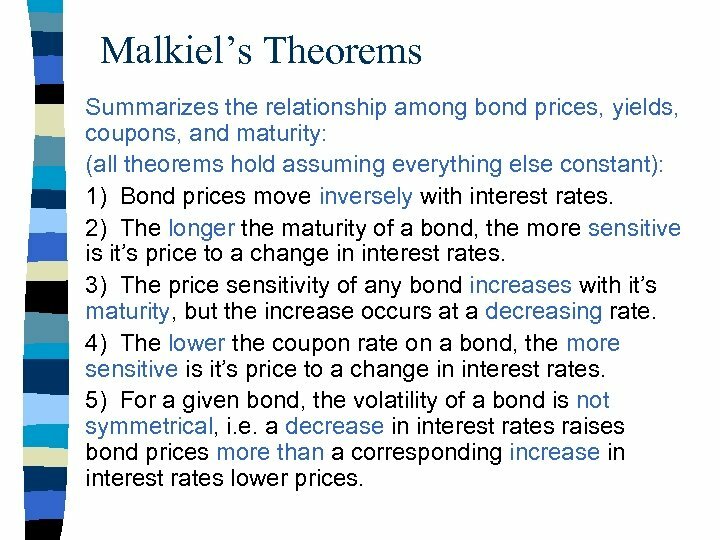 Malkiel’s Theorems Summarizes the relationship among bond prices, yields, coupons, and maturity: (all theorems hold assuming everything else constant): 1) Bond prices move inversely with interest rates. 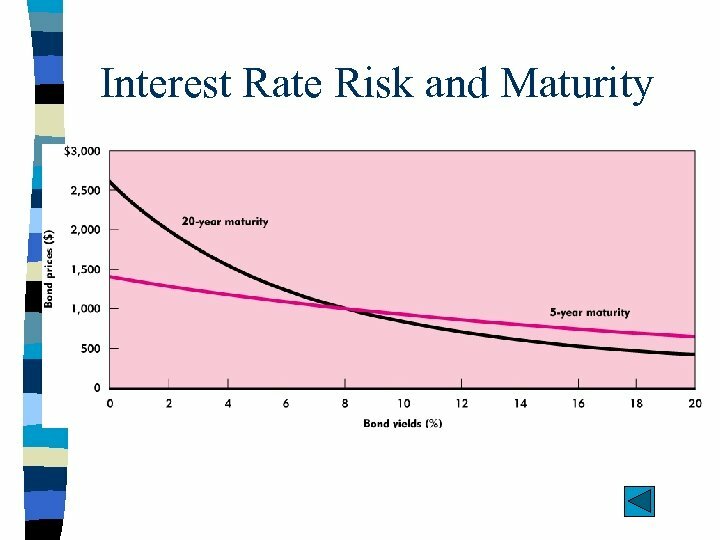 2) The longer the maturity of a bond, the more sensitive is it’s price to a change in interest rates. 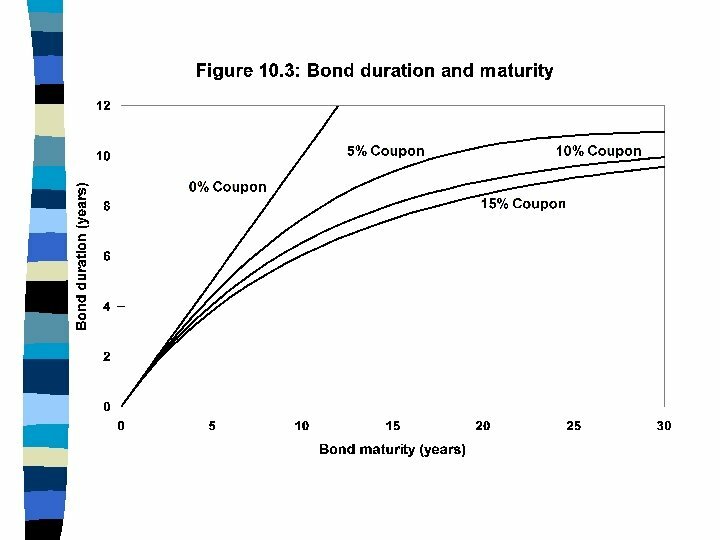 3) The price sensitivity of any bond increases with it’s maturity, but the increase occurs at a decreasing rate. 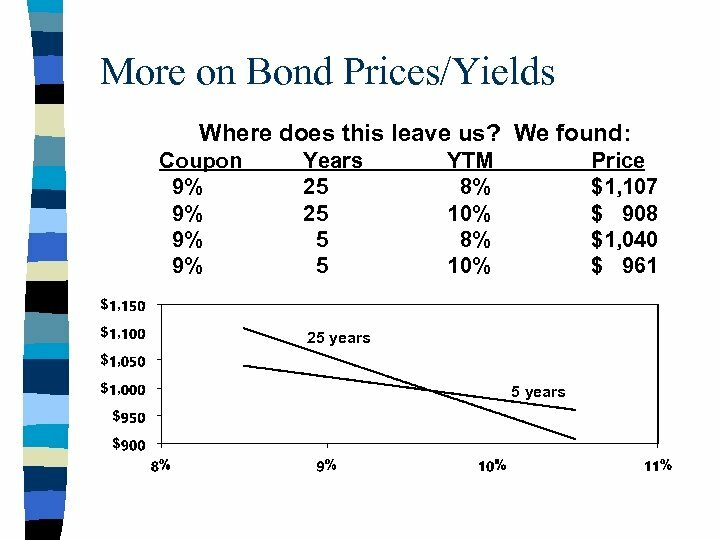 4) The lower the coupon rate on a bond, the more sensitive is it’s price to a change in interest rates. 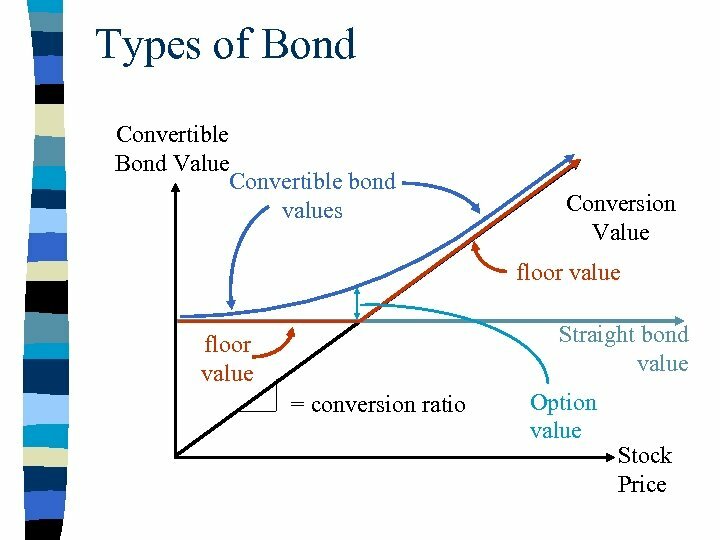 5) For a given bond, the volatility of a bond is not symmetrical, i. e. a decrease in interest rates raises bond prices more than a corresponding increase in interest rates lower prices. 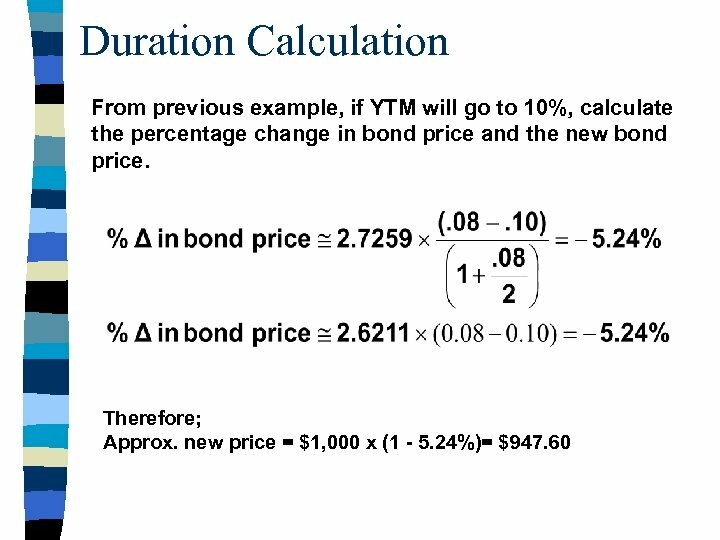 Duration n Although modified duration allows us to estimates of price change in a bond’s price for a small change in required yield, it does not provide good estimates of a large price change in required yield. 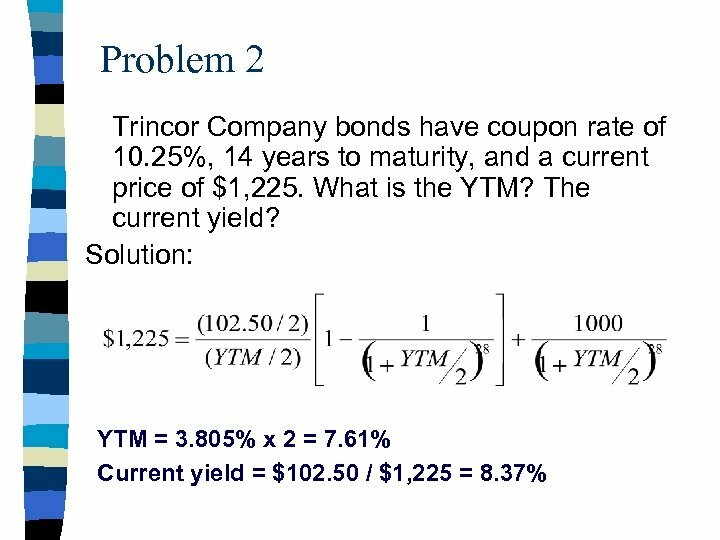 This is because of the convexity in the price/yield relation ship. 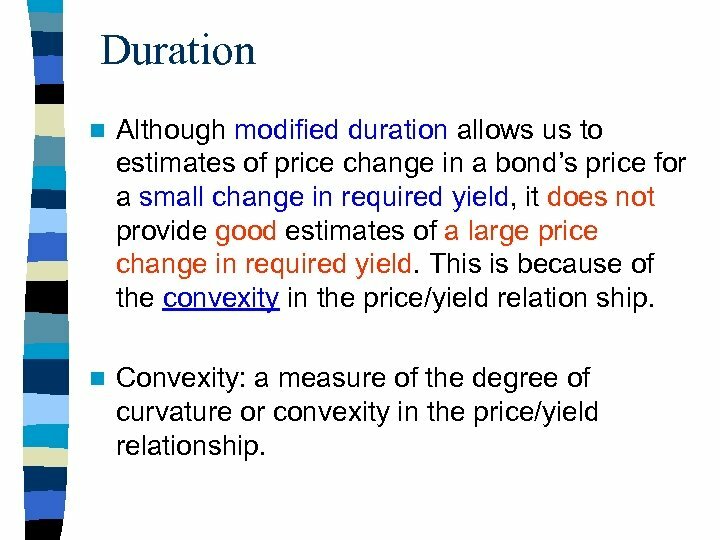 n Convexity: a measure of the degree of curvature or convexity in the price/yield relationship. 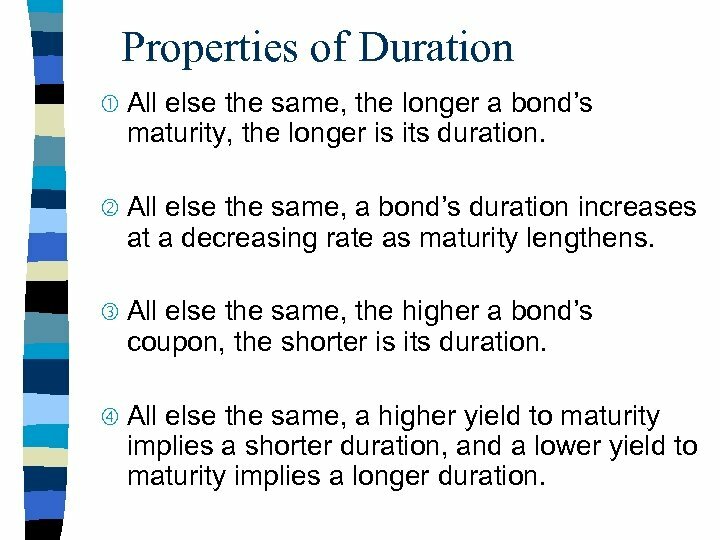 Properties of Duration All else the same, the longer a bond’s maturity, the longer is its duration. 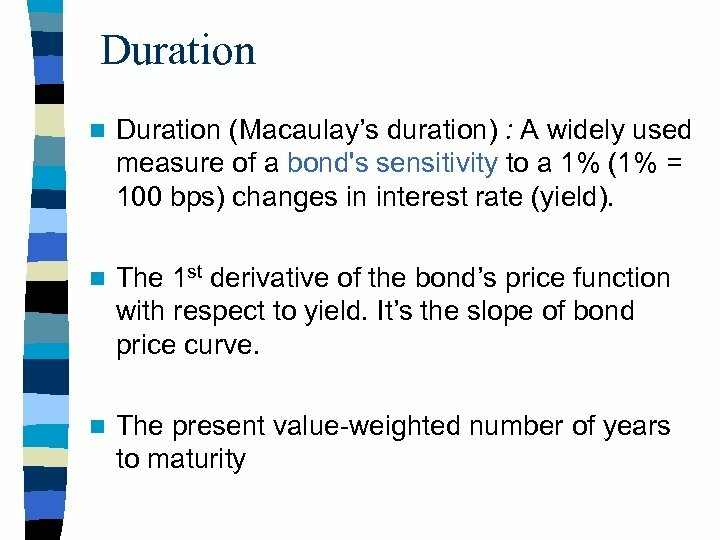 All else the same, a bond’s duration increases at a decreasing rate as maturity lengthens. 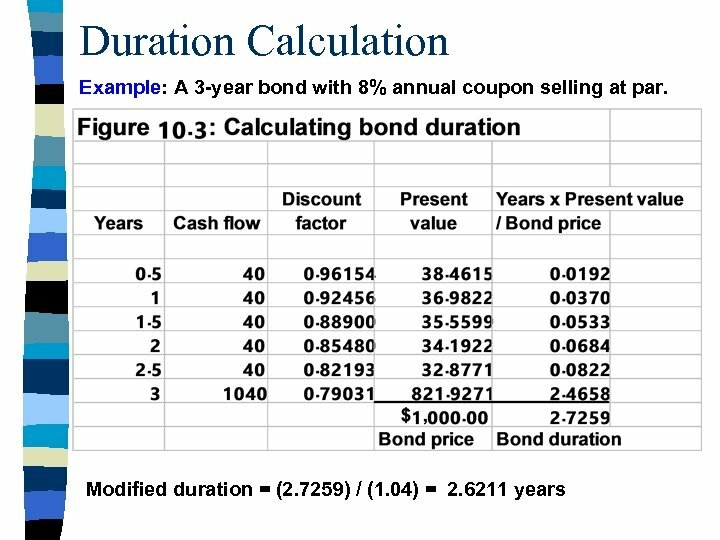 All else the same, the higher a bond’s coupon, the shorter is its duration. 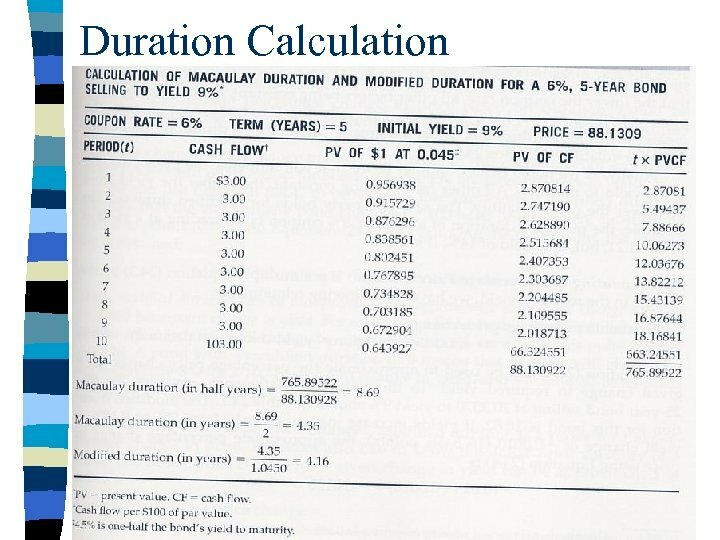 All else the same, a higher yield to maturity implies a shorter duration, and a lower yield to maturity implies a longer duration. 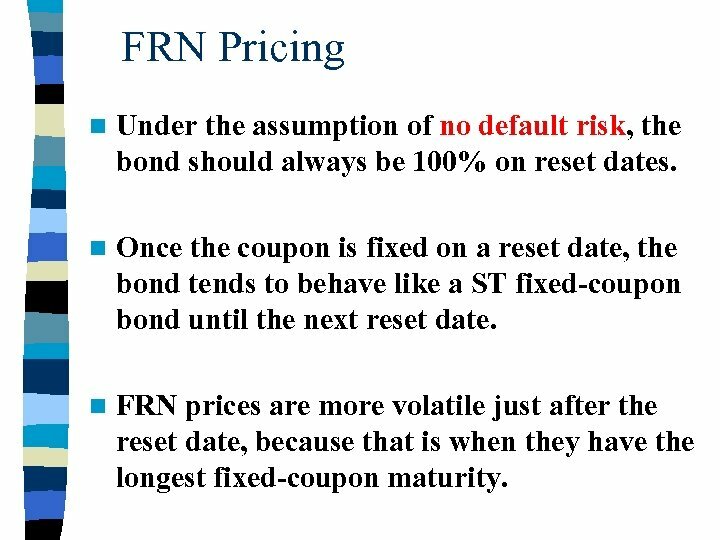 FRN Pricing n Under the assumption of no default risk, the bond should always be 100% on reset dates. 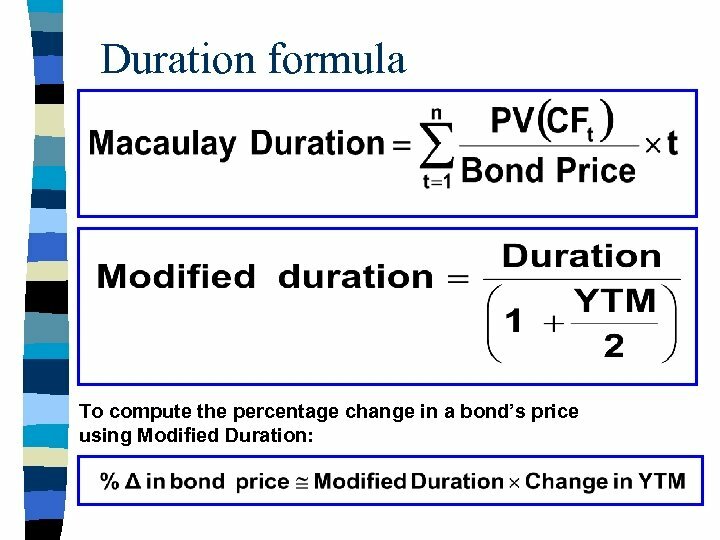 n Once the coupon is fixed on a reset date, the bond tends to behave like a ST fixed-coupon bond until the next reset date. n FRN prices are more volatile just after the reset date, because that is when they have the longest fixed-coupon maturity. 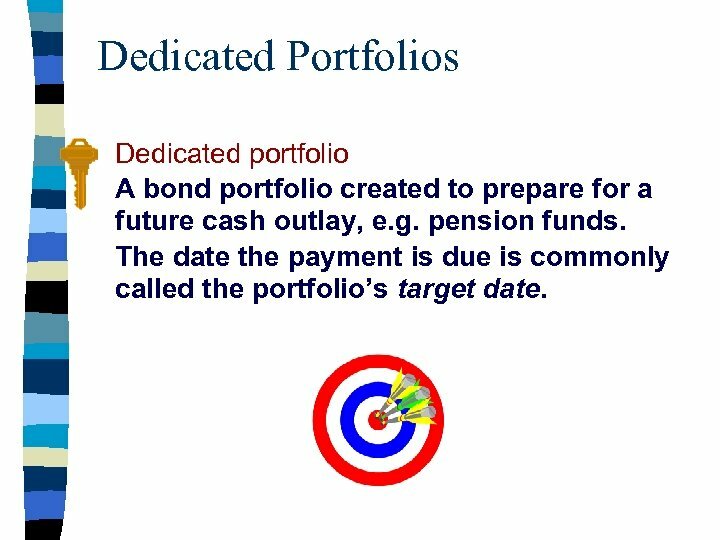 Dedicated Portfolios Dedicated portfolio A bond portfolio created to prepare for a future cash outlay, e. g. pension funds. 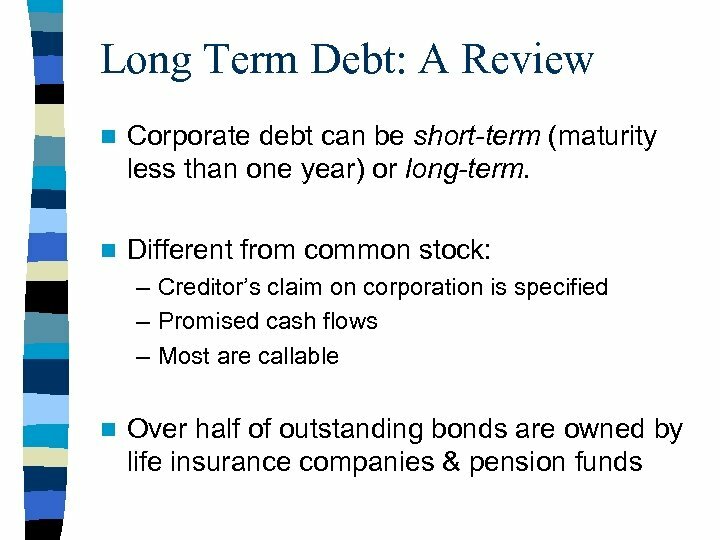 The date the payment is due is commonly called the portfolio’s target date. 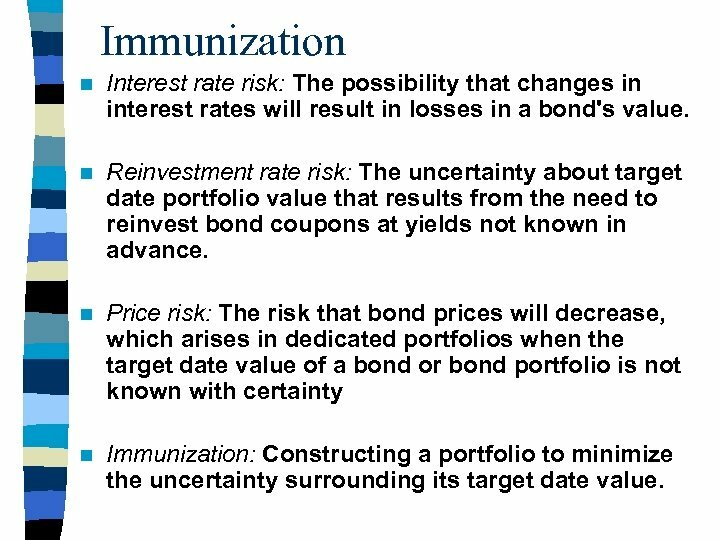 Immunization n Interest rate risk: The possibility that changes in interest rates will result in losses in a bond's value. 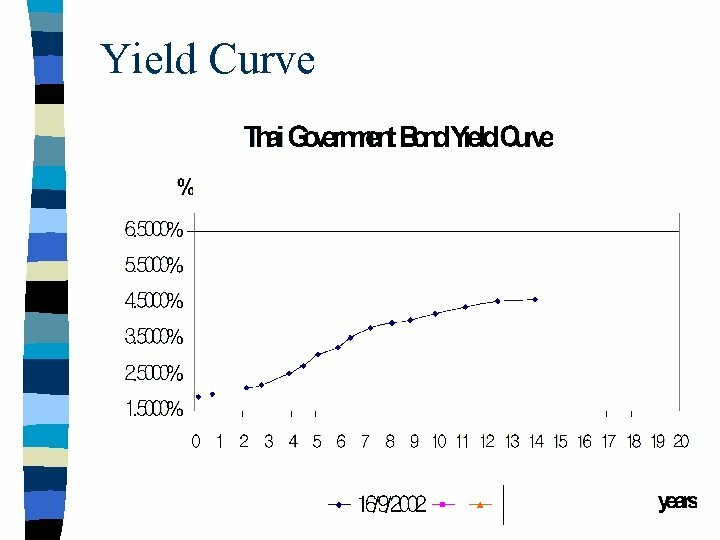 n Reinvestment rate risk: The uncertainty about target date portfolio value that results from the need to reinvest bond coupons at yields not known in advance. 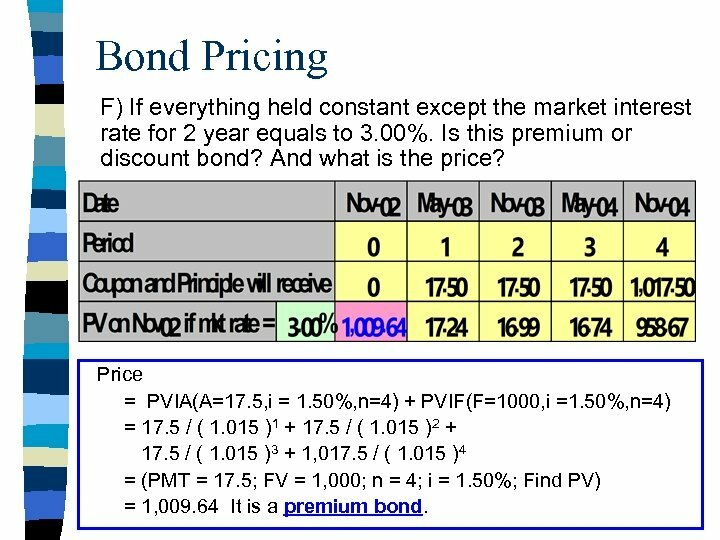 n Price risk: The risk that bond prices will decrease, which arises in dedicated portfolios when the target date value of a bond or bond portfolio is not known with certainty n Immunization: Constructing a portfolio to minimize the uncertainty surrounding its target date value. 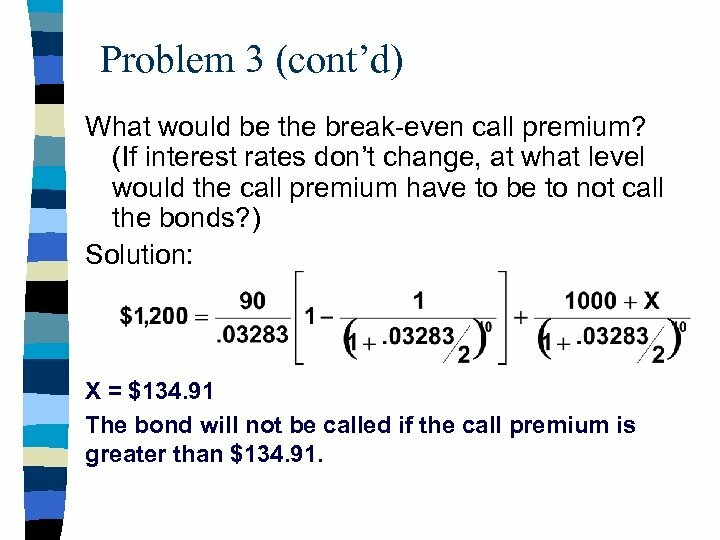 Problem 3 (cont’d) What would be the break-even call premium? (If interest rates don’t change, at what level would the call premium have to be to not call the bonds? ) Solution: X = $134. 91 The bond will not be called if the call premium is greater than $134. 91.